Besides turkey and stuffing, we usually associate this Thanksgiving holiday time with family. My family recently suffered a great loss. Since I originally posted this blog, my Daddy passed away on November 8th, 2018. Dad’s favorite part of the Thanksgiving meal was devouring Mom’s homeade pies — pumpkin, pecan, gooseberry, chocolate, coconut — all 100% homemade with love from the filling to the flaky Crisco-laden crust. I worked tirelessly after his death to complete the steps to fulfill his last wish. He wanted his body donated to science which was fitting for the intellectual and unique fellow my dad was. Perhaps he will contribute to research about the Alzheimer’s mystery. Body donation makes sense and I may decide to follow in his footsteps to someday further MS research upon my own death. The organization I worked with and highly recommend is http://medcure.org/donor. 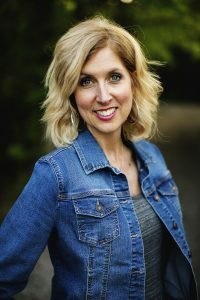 As I began to write a eulogy last week, I remembered this article and realized I’d already put my thoughts of gratitude to Dad here. 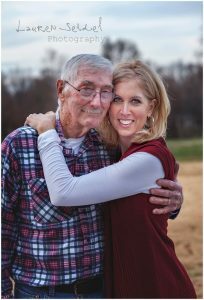 What started as a blog, became the words I shared at the Celebration of Life memorial service for my Dad last week. In his honor, I thought it only fitting to share again. ~Stumble to Rise is about my life but like all of us, I’m a compilation of those who’ve influenced me. I feature one of them in my book and today: My Dad — Max D. Whitlock. Both of my parents greatly inspired me. But it’s my dad, in particular, whom I’m most like. Due to the cruelty of Alzheimer’s, Dad won’t be able to read this. If he could, he would get a great kick out of it. As I explain in my book, he doesn’t know me now and is not able to transport himself from the bed to the toilet without the aid of a Hoyer lift or at least two very strong helpers. His story is not ending as he had hoped. The solace, however, is that he lived his dream life with complete joy and love! Because he played such a formative role in my world and therefore in my book, I thought it only fitting to share 10 things about him that have influenced who I am. 1 …loved my mother intensely. I always knew that their relationship was the backbone of our family. I took comfort in knowing their love came first. Until he could no longer remember my mom, he looked into her eyes and told her daily that she was beautiful and he loved her. He did this openly but seemed to tune out everything around them at that moment — focusing only on my mom. It was as if the two of them were momentarily transported into their own bubble. Dad showed me the kind of love I deserved. Thanks to him, I found it with my husband of now 27 years. 2 …wrote daily letters to my mom starting the first day he was stationed in Japan — just one week after meeting her. They courted via US mail and he even proposed in writing. My mom kept his beautifully written letters hidden all these years. Yes the letters will be the center of a future book. 3 …was highly intelligent and was usually reading three or four books at once. Growing up, there were books everywhere. I’ve found that most people are good at math and science or English and literature. My parents greatly excelled at both which always amazed me.They were lifelong learners. 4 …was the most compassionate person I’ve ever met. He rooted for the underdog. He was open-minded and non-judgemental. He gave to organizations that helped those who needed it most. But it went much deeper than that. He supported anyone he came into contact with in whatever way they needed. If they needed a car, he provided it. If they were strapped for cash he gave it. If they needed a place to stay, my family took them in — several of whom didn’t want to leave and remained with us long term. He often hired unappealing and unemployable individuals. He would find that person no one else believed in and would give them a shot — the disabled, the ex-con, the unskilled. He changed many lives. A few took advantage of him but it didn’t change how he operated. He found pple that no one else had ever believed in but he did & they almost always rose to the occasion. One of my favorite quotes is by the great Maya Angelou…I’ve learned that people will forget what you said, people will forget what you did, but people will never forget how you made them feel. He lived this daily. 5 … was always scheming and kept a notebook at the kitchen table where he recorded his ideas. Like I explain in Stumble to Rise, he didn’t act on every single one of them but in total he started and operated at least a dozen different businesses (with my mom organizing the details behind the curtain). 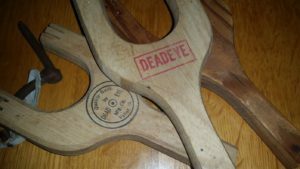 One of the first, Dead Eye Mfg, was a company that made slingshots; all because he couldn’t find a good one for Mom’s then 15-year-old brother. There were five-locations of Karpet Korner plus Office Furniture Warehouse, Baron Stove Co, Rug and Tile, Hardwoods of Illinois, Hill City Raquetball Club, M & M Forklifts, to name a few. He worked for himself his entire life. Coincidentally, I inherited that gene and can’t imagine not being my own boss. 6 …was a master of PLAY! He created a home centered around fun that kept us and many of our friends nearby. On our 25 acres we had pinball machines, ping pong tables, a basketball court, tennis court, steel-constructed jungle gym, three wheelers, bicycles, board games galore, tandem bikes, recumbent bikes, sleds, washers, yo yo’s, tetherball, volleyball, pogo sticks, stilts…you name it. He worked hard and played even harder which made for an extremely fun childhood. 7 …never wasted his energy on worry. As a risk taker, he expected to stumble in business and in life. When things went wrong, he smiled, recalculated and kept going — learning and loving along the way and never taking himself too seriously. 8 …ran two miles every other day for 40 years! It didn’t matter if the weather was rainy or cold or hot. He ran. He knew the power of exercise. He didn’t stop until he was 84 and couldn’t remember his way home from the old road behind our house. 9 …was always up for adventure! He adored spontaneity. Family vacations weren’t planned. We got in the car and decided where to go. When I was six, and my two sisters were preteens, my family spent a month in Europe never knowing where we would lay our heads each night. We winged it and made great memories. He said that was half the fun. 10 …would announce daily…”It’s a beautiful day!” I would usually say, “But Dad, it’s raining” or, too hot or too cold…to which he would reply, “Oh that doesn’t matter!” He believed every day was a gift and that the world was made up of mostly good people. I agree! 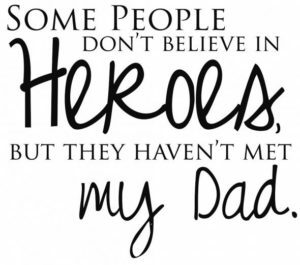 Thanks Dad for telling me every day how much you loved me and for making me the person I am today. I’m proud of my little sister. Thanks Laura — That means a lot!